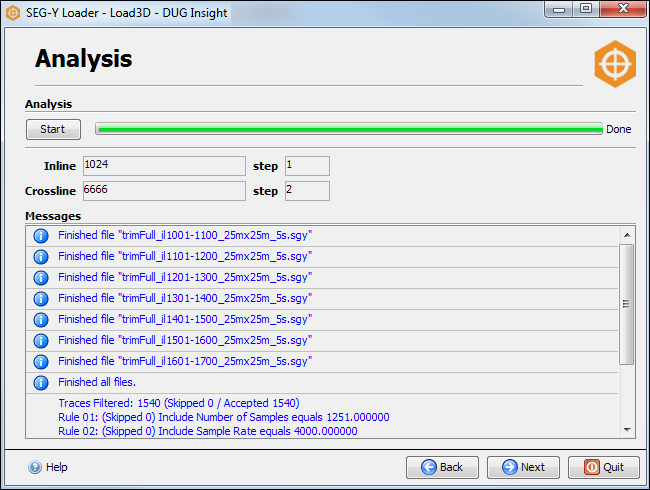 The next step is where the SEG-Y Loader uses the header mappings to analyse the SEG-Y data and detect problems. For loading 3D data, this step will discover the inline/crossline values in the data, the shape and geographical location of the data (if calculating tie points from X/Y headers) and any invalid data. In the Analysis pane, click Start. During analysis, the SEG-Y Loader parses the data file to determine spatial extents, increments, and the possible tie points for conversion between inline/crossline and X/Y coordinates (if you have selected the option for the SEG-Y Loader to calculate the tie points from X/Y headers). If a gather dimension was specified, its range will also be calculated. At this stage, the SEG-Y Loader will analyse the entire dataset. Warnings are displayed at the bottom of the page during analysis. If no errors are reported, click Next to move to the next step (see Defining a Survey).